I noted that they denied storing of any high level waste at the facility. In fact there are hearings coming up whether they should be allowed to store any high level wastes, its a very hotly debated thing in the community. I busted them dead to rights. I do also frequent pro-nuker sites, I like to see what they have to say and to refine my own knowledge. I go with an alias of course. 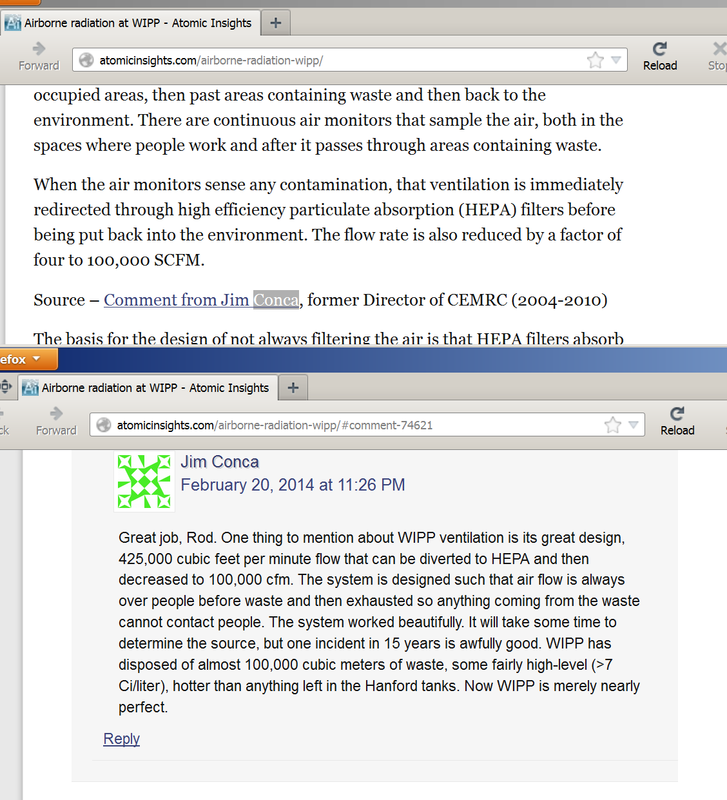 I caught the former director of CEMRC (2004 to 2010) bragging about how the facility has 100,000 cubic meters of waste. "Some fairly high level (>7ci/liter), hotter than anything left in the Hanford tanks"
Jim Conca was bragging at atomicinsights.com (Run by Rod Adams, a well known pro nuke promoter). His comment was specifically called out by Rod Adams and put into the text of an article. Rod also speaks directly to Dr Hardy, and others high up in the nuke industry, he is an insider. Don't believe, run the links yourself, but here is more from the conversation. These guys are smart, it is sad when they get down to talking about bananas and flying and dental Xrays. Hi Rich, you’re right, these high-volume ambient aerosol collect only particulates, like pollen. But the ones we put at WIPP and environs are special. They are 20 x 25 cm Gelman A/E™ glass fiber filters that collect at a flow rate of ~1.13 m3 min-1. After collection, they’re removed using special handling protocols and taken back to the CEMRC radlabs and analyzed for selected radionuclides, including 238Pu, 239+240Pu and 241Am. Following 6 hr of heating in a muffle furnace at 500° C, which drives off organics, the tracers and the iron carrier are added and each filter is treated with HF+HNO3 up to the complete decomposition of silica. Then it is treated with conc. HClO4 and HNO3 for the removal of fluoride ions. The actinides are then separated as a group by co-precipitation on Fe(OH)3. The nuclides of interest are precipitated with LaF3, deposited onto filters, mounted on planchettes, and counted on an Oxford Oasis alpha spectrometer for five days. Gamma-emitters are measured in the air filters by Gamma spectrometry for 48 hours. We routinely get to the femtoCi level. An important finding of our earlier studies was that the activity of Pu and the concentration of Al in aerosols were correlated and this was driven by the resuspension of dust particles contaminated with radioactive fallout from past nuclear weapons tests. Similar results were found for Am and Al. Related studies of soils collected on and near the WIPP site have shown that correlations exist among Al and both naturally-occurring and bomb-derived radionuclides including 239+240Pu. If you’re interested, check out the annual reports at http://www.cemrc.org (I was Director there from 2004 to 2010). It is a very nice facility with great scientists. Jim, thanks for some interesting details. It is depressing to see how much of our money is being wasted pandering to the irrational fear of very low level radiation, making nuclear technology more expensive than it should be. Now I am, confused. How does a Continuous Air Monitor alarm work continually if you have to take out the filter and do every thing you said? Both Rods article and the linked article refer to an alarm on a “Continuous Air Monitor.” That to me means there is a detector facing the “dirty,” collected side of the filter medium. Or are you describing what takes place AFTER one has alarmed and the facility wants to determine exactly what caused the alarm? The Continuous Air Monitors (CAM) view the collection filter in real time with a ‘surface barrier diode’ alpha detector. The intake air with particles is drawn aerodynamically around the disk detector and impinged on the surface of the filter. The detector has sufficient ability to sort the various alpha energies from 241Am/238Pu and 239/240Pu along with various short lived progeny of 220/222Rn, most of the time. There are technical issues with dust overmass on the filters over time as well as interference from straggling energies of the radon progeny. (The air between the filter and the CAM detector is also ‘overmass’.) That’s the natural environmental stuff and is a confounding interfering background for the live performance. In order to overcome the interference of overmass, the filters are changed periodically for retrospective assay as Dr. Conca describes The former is in-situ, the latter is destructive in the lab. Due to the ultra low incidence of material, it takes a lot of effort to perform the real time as well as the lab activity. It’s not cheap, but it’s VERY sensitive. Sensitivities with the high volumes are typically less than 2e-14 uCi/ml, not very many atoms. Great work as always, Stock. Thanks for your diligence. Yep, thanks, this was a good one. Catch them lying in the act, on an important topic. You give the boys a cave and they think they can do anything down there. Quote of Jim Conca: "What are you talking about? Nothing will get much past the WIPP boundaries, only a Bq was seen near the gate at the CEMRC Hivols. Modeling in Texas is nonsense. As the previous Director of CEMRC, I know these issues quite well, and this is the first release at all from WIPP in 15-years of operation. If you what to put nuclear waste away for ever and ever, this is the place, no matter the source of the waste." I love it "no matter the source of the waste" 7Ci/liter, huuwah, break out the Kooaid guys. that Bobby is doing great reporting. yes, classic playbook, the truth comes out little by little. They were probably hushing these people up with promises of "we'll take care of any health problems and monitor for free...."
Excellent, thanks for also linking the Rough Transcript of the town hall liars. Good to see that you are back, Stock! Does this latest event jeopardize the Class 3 Permit Modification? I think WIPP could be a tipping point, I think we need to max out the opportunity to reduce radiation production, and liklihood of exposure. fantastic post. i attempted to join the site and couldn't -- thought you should know. i intend to reference/link/quote at ah, mephistophelis in an upcoming showcase of ...possibly not well known facts, if you will. You didn't bust anyone because you haven't defined what levels constitutes high level waste! Doh! So your high fives are premature. Uh, if 1 liter can contaminate 1 Billion chickens.....that is high level waste. Do you disagree, don't base any rebuttal on semantics.